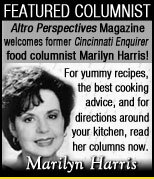 Our Featured 'Retro Food Columnist' for Altro Perspectives, Marilyn Harris, coming to us from a past bio that includes writing for The Cincinnati Enquirer, as well as being a radio and TV personality, a cooking teacher and a consultant for the food industry. 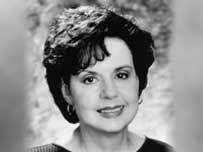 Hailed by the late Bert Greene as “the undisputed doyenne of cuisine in the Midwest” and her foods being for sale at Remke/Bigg's stores has made her even more sought-after than ever. When you crave an old-school, traditional meal like your mom used to make, with all the trimmings, but you want a more professional slant that includes lots of bonus dishes your mom didn't even know about, Marilyn is your go-to lady of the most fabulous 'retro cuisine'! Read one of her most cooked dishes by local fans by clicking here.